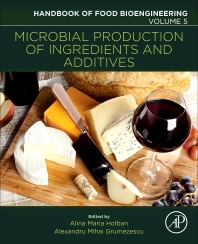 Microbial Production of Food Ingredients and Additives, Volume Five, the latest release in the Handbook of Food Bioengineering series, is a solid resource on how microorganisms can increase food production and quality. Microorganisms are used to create and enhance food, used as food additives to improve food taste, and in improving function and fortification to benefit overall health. The book presents the applications of microbial products in food bioengineering and methods to obtain valuable ingredients, such as sugars, acids, secondary metabolites, enzymes and vitamins. Recent and future applications of these microbial – derived food components are discussed, along with future applications.